When we left off with last week’s debut episode of the Horsepower Wars $10K Drag Shootout, the four teams — still gassed from testing their physical mettle against one another in the $10K Olympics — had, in the order they finished the competition, chosen the chariots for which they would spend the next nine and a half days preparing for battle. For Boddie’s team, it was the Buick Regal; Team Stinky Pinky took the third-generation Camaro; and the Dream Team and Team Bigun had selected the Fox-body Mustangs — a 1990 GT and a 1986 GT four-eye, respectively. After a little trash-talking amongst the teams — who, as we learned, all had plenty of trash to sling — it was time to get to work and get dirty. 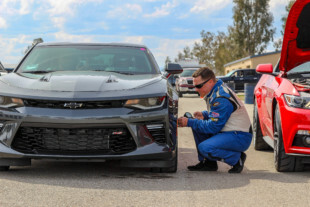 Because the cars were purchased virtually as-is out of classified ads or on Craigslist, they came in various states of completeness and disrepair, and so right out of the gate, some teams had more or less work than others to strip the cars down. The Dream Team, for example, chose an already partially-stripped car, allowing them to get to work on the cage right away, whereas Team Bigun had to hustle to get everything off of and out of their more complete four-eye. As the builds got underway, so too did the drama. Any racer worth their salt will try to bend the rules and search for grey areas to seek an advantage, and the teams have done precisely that, including the Boddie/Dow Brothers camp, who arrived with a set of cylinder heads that, well…didn’t quite match the description. Will they be allowed to keep them? What ensued was an all-out assault on these four cars by their crews as they sawed and drilled their way down to largely the bare shells, leaving piles of steel and plastic strewn across their work areas and filling trash cans and dumpsters to the brim. Even with nine more days at their disposal, though, time was of the essence, and while members of the crews tore the cars down, others were devising their powertrain plans and scouring Summit Racing Equipment’s website for parts. The big challenge was budget. Each team was equipped with $3,000 cash and $7,000 in Summit Racing gift certificates to build their cars. This is a very tight budget given how fast the team’s were planning on making their cars — all were shooting for the 8-second zone. 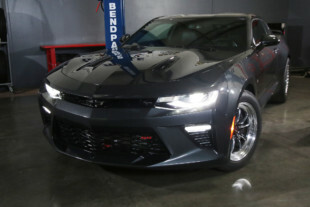 Summit was providing no-charge overnight shipping to the teams on all in-stock items from its massive in-stock inventory, which was a virtual requirement for building these cars in such a brutally tight timeline. In the name of safety, each of the teams was provided with a pre-bent Rhodes Race Cars roll cage (left) and aftermarket Baer race brakes. Each of the teams, in the name of safety, was provided with a pre-bent, 10-point mild steel roll cage from Rhodes Race Cars specific to each chassis that they would use. Rhodes sent us two Mustang cages, a third-gen cage, Fox-body cage, a G-body cage, fourth-gen F-body, and then a generic kit for the Falcon. Josh Rhodes from Rhodes Race Cars made sure that the cages were pre-fitted and precision-bent, and shipped to the build center in plenty of time for each team to begin fabrication. The cages were all 10-point that should certify to an 8.50 when included with the Rhodes driveshaft safety loops. Rhodes even threw in transmission cross-members and some extra one-inch and 1-5/8-inch chrome-moly tubing. Amazingly, each kit was installed within a day, so that tells you how well they fit! We also required that each chassis would be NHRA certified, so the teams had to ensure that their roll cage and installation was completely NHRA-legal. Miller Welders hooked the teams up with one of their world-class welders to install their roll cages and fabricate any necessary parts for their cars. Miller Welders came onboard to support every single team with welding gear, which was used to tack up and final install the Rhodes cages. In total, Miller provided four 210 Syncro Wave TIG welders, two 211 MIG welders, and two 215 Multimatic (MIG) welders plus spool gun kits, gloves, some badass-looking helmets and masks, and jackets. The teams were well equipped, to say the least. The Miller stuff was a life-saver and gave every team what they needed for the builds. Another safety item, Baer Brakes provided a set of their high-performance brakes for each car, so the teams wouldn’t be inclined to rely on the stock binders to stop from their potential 150 mph passes. Suffice it to say, these might be the shiniest item on these cars that are otherwise chock full of old, dilapidated parts. We’ll dive more into the brakes when we do the builds in a secondary episode. 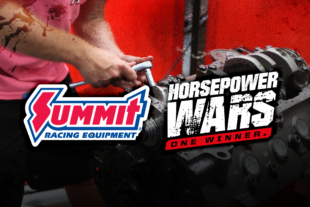 The teams have been burning up the Summit Racing Equipment website to price and compare parts. With $7,000 at their disposal, the lion’s share of the new parts that will go onto these cars will come from Summit, which had even extended next-day delivery to the teams to get the parts in-hand and on the cars as quickly as possible. Team Bigun, despite the extra work on their plates, made some solid progress in the opening days of the build, as they removed the entire front clip up to the shock towers to lighten the car and removed the rearend and axles to begin work on beefing things up. The crew, led by Eric Yost, also went to the drawing board on their engine combination, deciding they would likely be going the GM LS route with a turbocharger. 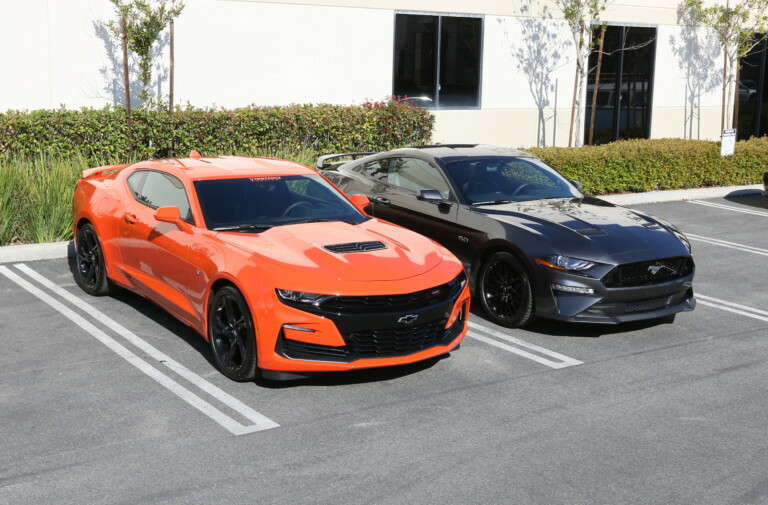 The LS combination, like the real-world, is a popular choice given how cheap and reliable the engines are, and, as you’ll see, more than one of these teams exploited that very fact during the $10K Drag Shootout. While the rest of the crew was tearing their '86 Mustang down and preparing it for construction, Team Bigun's engine building wiz Peter Harrell (bottom left) was already toiling away at the cylinder heads to make some horsepower. 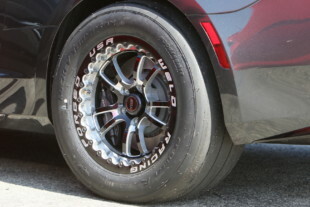 Team Boddie/Dow Brothers, who finished third in the $10K Olympics, selected the Buick Regal, which they affectionately named the G-Boddie, in large part for its ideal front suspension setup. Boddie, of course, is a fan of GM G-bodies, and given the weight penalty of the Camaros, decided it was the most competitive option available. Team Boddie/Dow Brothers hard at work on the affectionately named G-Boddie. On day one, the Russ Wullenwaber-led squad cut the frame crossover support under the engine and replaced it with tubing to save some weight, and also cut frame horns up front to replace with tubular pieces. They also cut the internal structures out of the fenders and bumpers to get more weight out of the car. While that was ongoing, other members of the team procured an O-ringed big-block Chevrolet and an 8.8 rearend housing from a Ford Explorer. But the team’s early progress wasn’t without incident. In one of the more drama-filled standoffs of the 10 days, the Horsepower Wars staff found issue with a set of CNC-ported cylinder heads the team had procured that were purported as as-cast. Officials were adamant the heads didn’t match the parts description, while the team vehemently denied any wrong-doing. What did the team and officials finally settle on as a resolution? You’ll have to tune in next Thursday to find out. Disco Dean Karns and his Ohio-based Stinky Pinky crew struggled in the early days of the build, exacerbated by an issue the officials took with a super-cheap rearend they acquired for their Camaro. There's not much Camaro left in Stinky Pinky's Camaro after they stripped it down. Team Stinky Pinky, saddled with the final vehicle choice, got right to work on their white third-gen Camaro — a car they admit was not in their game-plan. 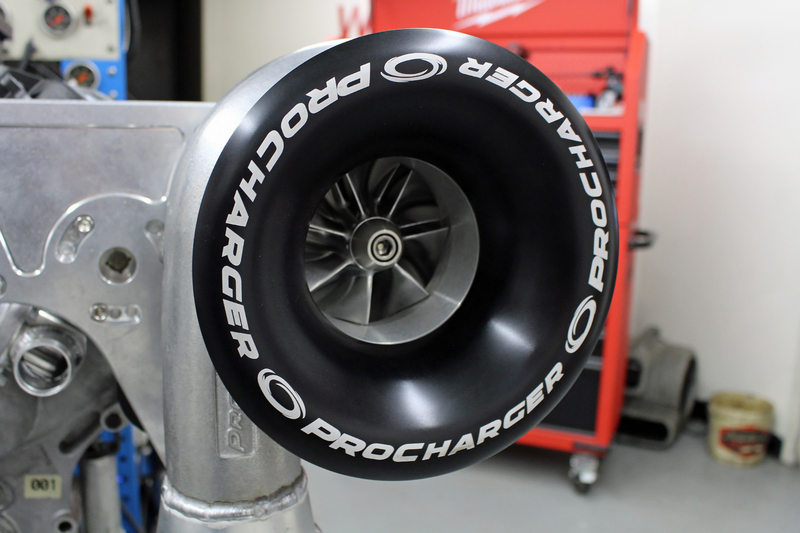 Team leader “Disco” Dean Karns, whose engine combinations are as flashy as his personality, had already planned ahead for the build, procuring and arriving with a roots supercharger to bolt on to his team’s ride. Early on, they were able to acquire a big-block Chevy to mate to the blower, and also found a screaming deal ($300) on an aftermarket 12-bolt rear with 35-spline axles that the Horsepower Wars officials immediately chose to review, believing the team had bartered a “buddy deal” to procure them at a less-than-market price. Stinky was behind from the get-go, with a busy racing schedule and perhaps a lack of preparation. 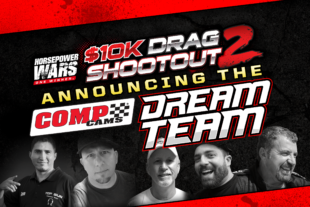 Stripping, measuring for the roll cages, and engine building were the name of the game through the first two days of the $10K Drag Shootout, as the Dream Team illustrates. The Dream Team, for their part, also wasted no time in their planning and preparation. 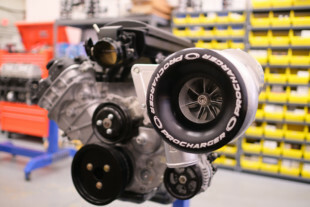 Prior to arriving in California, they found a 5.3-liter LM7 long block with intentions of going the turbocharger route. Before the close of the first day, the COMP Cams, Jeff Reed-led crew was already well into roll cage fabrication, with the main hoop, rear bars, and front bars tacked into place. They also got to work on the engine itself, tearing it down to send off to a local machine shop. The teams tackle the COMP Cams Building Challenge. But that wasn’t all the Dream Team accomplished: they also scored a decisive victory in the Building Challenge, as they stacked the scrap parts from their vehicle, using only zip ties, higher than the other three teams. 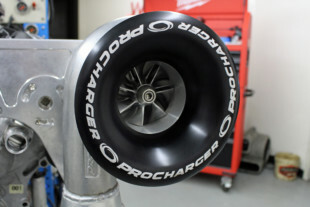 Their victory earned not only a custom-grind cam from COMP, which agreed to grind the cam based to the team’s specifications and ship it out within 24 hours, but a set of QA1’s aluminum Stocker Star adjustable rear race shocks for their car, as well, giving them a leg up on the rest of the teams. Next week, we’ll find out how the jury ruled regarding the grey area exploits — or perhaps outright street racing-level tricks — of the Stinky Pinky and Boddie/Dow brothers teams, as all four squads head into the mid-way point of their $10K budget builds. 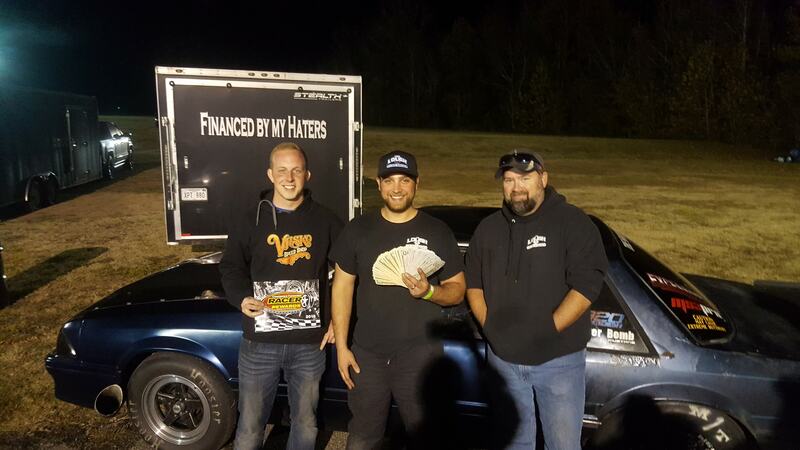 The Dream walked way the victors, earning a COMP custom-grind camshaft and a set of QA1 shocks. 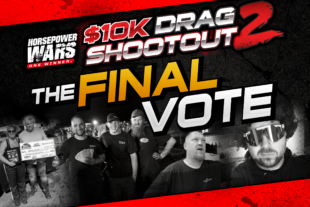 In case you missed it, Horsepower Wars is offering YOU the chance to driver away in one of the four cars built during the $10K Drag Shootout, along with a host of other prizes we’ll be awarding to viewers over the next eight weeks. 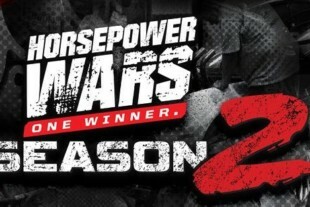 To enter, simply visit horsepowerwars.com/giveaway. 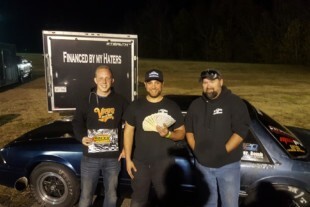 The Dream Team collecting their winnings: a free custom-grind COMP camshaft and a set of QA1 rear shocks for their Mustang. 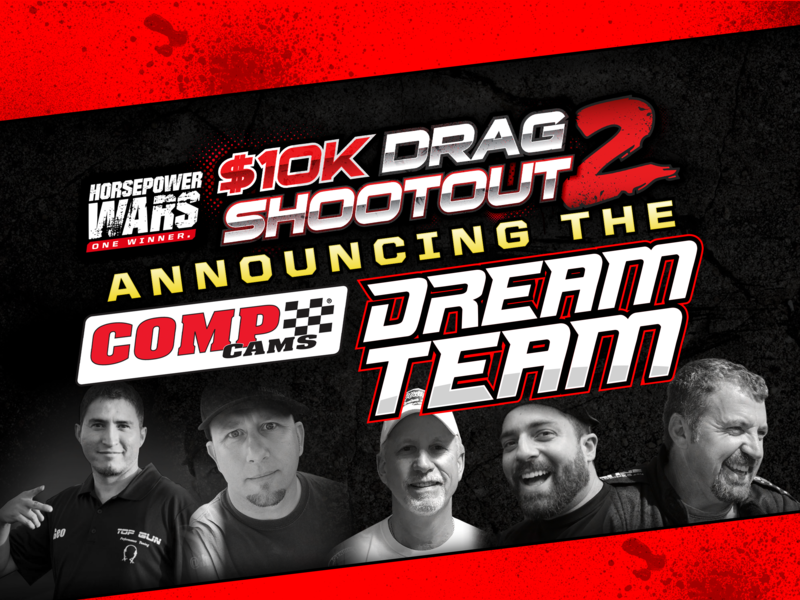 The Horsepower Wars $10K Drag Shootout has been made possible by some of the leading companies in our industry, including Royal Purple, Comp Cams, TCI Transmissions, Mickey Thompson Performance Tires & Wheels, E3 Spark Plugs, Fragola, Holley, Diablosport, Mahle Motorsports, Dyna-Batt, ProCharger, Weld Racing, ARP, BMR Suspension, QA1, PRW, Covercraft, and of course, Summit Racing.